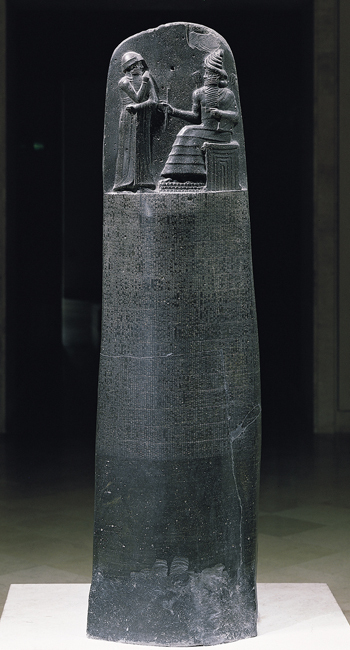 The Code of Hammurabi was written in 1760 B.C. It was created by Hammurabi, the King of Babylon, to set a standard for a way of living. It is the earliest sets of laws, and one that is preserved the best, of ancient Babylon. Hammurabi thought that he was chosen by the gods to bring standards to the people he ruled over. He says, in the code, that two gods came to him and told him to bring the law to his people. So, in return, he wrote the Code of Hammurabi. The reason Hammurabi created the laws was because he felt instructed to by the gods. That is the history of the creation of the Code of Hammurabi. The code consists of 282 laws that cover all the areas of life of that time period. The areas it covered were divided into sections. "The Code of Hammurabi makes a legal distinction between people based on their status as free or not free. "(Leick, 186) Also the punishment was given depending on the social class you were in. The Code is written in Semitic language. One of the sections was written on economic problems. It included trade, prices, commerce, and tariffs. Another section was written on the family. It included divorce and marriage. Criminal Law was another section. This included theft and assault. Civil law is the last section and it covers debt and slavery. The two classes that existed were the nobles and the commoners. The nobles were the upper class and the commoners were the lower class. It was also very obvious that men had more privileges than women. One thing that is also seen very common throughout the Code is the use of lex talionis. Hammurabi wanted his set of laws to be used forever and for justice to be administered under his rules. He says, "To the end of days, forever, may the king who happens to be in the land observe the words of justice which i have inscribed on my stele. "(Nemet-Nejat, 226) Hammurabi implicated that this is the way he felt the law should be set up. This is also how he believed wrong doers should be punished. He felt that the whole world should be run like this forever, as he says. These were the first set of written laws so it really did have an effect on the world. Some of the things he includes in the Code are still used in our society. The Code of Hammurabi had a very large effect on the world and History would have been entirely different if he had not written his code. As one can see the Code of Hammurabi has a very interesting creation. As the first law code ever written down, it contains a great importance. Hammurabi wanted his law code to continue for ever and still today we use some of the concepts throughout the world. Without the Code of Hammurabi the history continuing after it could have changed the world. The Code of Hammurabi has had a great effect on our world. Leick, Gwendolyn. Mesopotamia: The Invention of the City. England: Penguin Group, 2001. Nemet-Nejat, Karen. Daily Life in Ancient Mesopotamia. Westport, CT: Greenwood Publishing, 1998.